Happy National Fried Chicken Day everyone! I’ll admit, I was taken surprise by this day. I was totally off the ball and haven’t been keeping up with the ever important “Foodie Days”. You may think I’m being sarcastic, but I’m actually kind of disappointed in myself! These random days are so light-hearted and fun, they make for decent potluck days, and they sometimes make me think outside the box. And by outside the box, I mean this time I’m referencing a Filipino CHAIN to celebrate. Enter…. JOLIBEE. 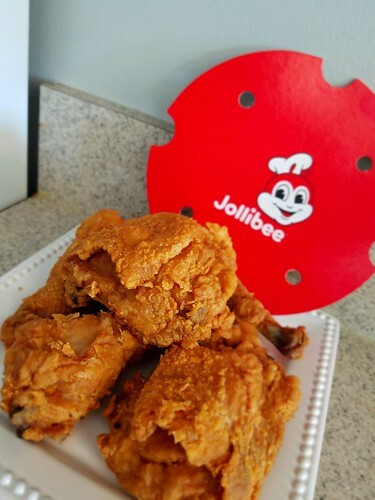 For Filipinos, specifically in the Chicagoland area, this was a huge freaking deal when the ‘bee first arrived. I’m talking, Six Flags-style lines, Black Friday-esque impatience… ya’ll really wanted your Chickenjoy. And if you didn’t catch what I said, this is a CHAIN. With that said, I will drive the 30 minutes, passing yellow archs, crowns, and ivory towers to get my fix. At first, I was such a hater – mainly because I hate crowds and for the first several months, that’s all I saw when passing by. But now that the hype has died down, I managed to finally get my order in. Let’s focus on the chicken – I love fried chicken, and they’re doing it and doing it and doing it well. And in case you haven’t gone in yourself, make sure to pick up their *peach mango pie* too. Better yet, get yourself like, 5. And hide that stash from your kids because they WILL steal them. And you will regret the things you say & do to your kids for being innocently drawn to sweet, sugary, beautiful things.